Those of you who also follow me on Instagram have already seen my comparison of OPI‘s Chasing Rainbows form their Spotlight on Glitter Collection and Rainbow Connection from another collection that was released way back. I’m not a huge fan of glitterbombs but I love Rainbow Connection for the lovely color combination. I’d hoped that Chasing Rainbows would have something different or extra to it, compared to Rainbow Connection. Sadly Chasing Rainbows is basically a recycled version of Rainbow Connection. I can’t spot a single difference between the two 😦 Nevertheless I don’t mind having two bottles though. I’ve read that there seem to be many other similar polishes from OPI going around. Especially with The Muppets Collection and the new Spotlight on Glitter Collection. Such a pity! 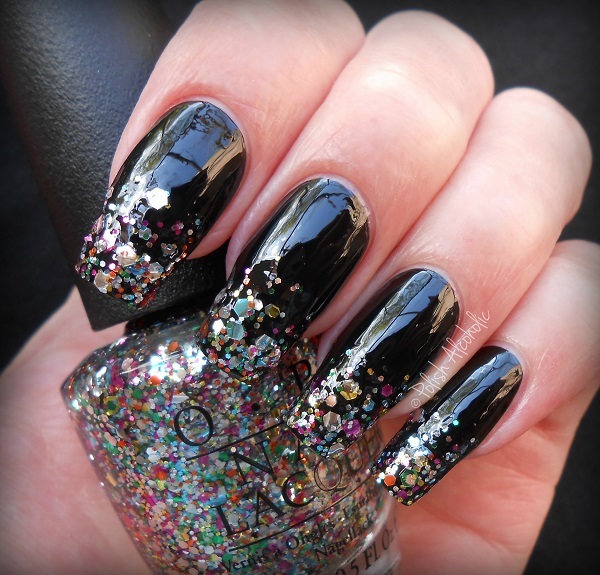 I also did a glitter gradient with Chasing Rainbows over black: What do you think of the Spotlight on Glitter Collection? 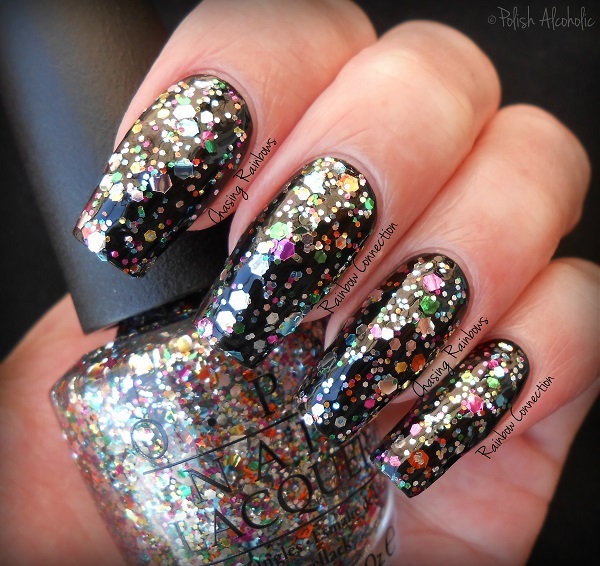 This entry was posted in OPI and tagged comparison, dupe, dupes, opi chasing rainbows, opi chasing rainbows rainbow connection, opi chasing rainbows vs rainbow connection, opi rainbow connection, opi spotlight on glitter by Polish Alcoholic. Bookmark the permalink. Jammer dat er weer een dupe in hetzelfde merk zit. Al moet ik toegeven dat ik het persoonlijk niet zo erg vind, omdat ik het adhd-glitters vind en echt too much voor op mijn nagels :). 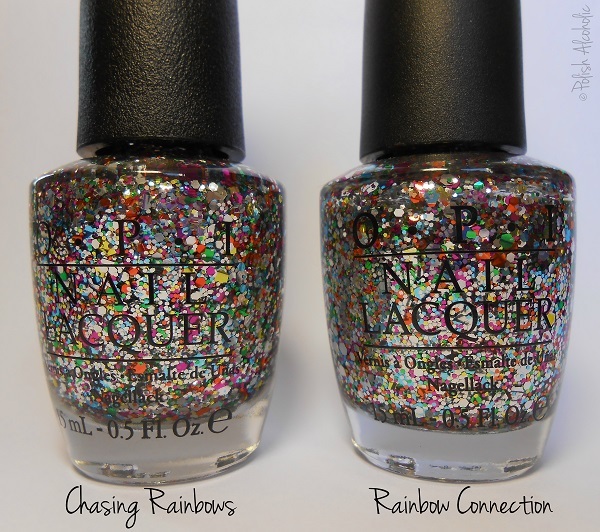 Wel vind ik Chasing Rainbows absoluut de leukste uit de collectie! Ze lijken idd t zelfde! Maybe they thought no one would notice? Either way it looks lovely over black, both ways you showed them! I have Rainbow Connection and you are 100% RIGHT. This is not the first time I’ve seen this sort of thing with their polishes though. Unfortunately, every company does it at one point or another. A friend who always sends me nail polish from Germany often says “They all look alike to me. I never know if I’m sending you repeat colors.” Now I know why. She can’t even get OPI there any more, only Essie. Thankfully, they don’t seem to repeat their colors often enough for anyone to point it out. I was really disappointed in this collection, I wish they hadn’t re-named polishes like they were brand new. They did it with Nicole by OPIs Rainbow in the s-kylie too, no difference there either.